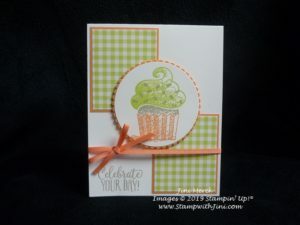 I can’t get enough of the Hello Cupcake stamp set that you can earn during Sale-a-bration for FREE. So this month I teamed up our fun Gingham Gala Designer Series Paper and the Hello Cupcake stamp set. When you purchase the items that I used for this card you can get the set for free! And of course what about a PDF tutorial? And stop back by tomorrow when I’ll be sharing some of the wonderful projects my team shared with me this month! This entry was posted in Cards, Techniques & Tutorials, Videos and tagged #imbringingbirthdaysback, Free Tutorial, Gingham Gala Designer Series Paper, Hello Cupcake by Stamp with Jini. Bookmark the permalink.